Barcelona is a dream vacation spot due to its countless, intriguing attractions! The Montserrat Monastery near Barcelona has been a place of great religious significance for generations. What began as a Roman temple to worship Venus transformed into a monastery in 880 A.D. by hermit monks. It has been said that unbelievable miracles occurred here in the 12th century that caused tremendous growth in the monastery. Today, this attraction is still a destination of pilgrimages and also serves as a place for people to visit and learn about the history of this area. Discover what this attraction has to offer and make plans to see it today! The Montserrat Monastery is perched atop a towering mountain, overlooking breathtaking views of Spain. If you’re traveling to this attraction from Barcelona and wondering how to get there, you can catch a train from the Barcelona-Plaça Espanya Station that leaves every hour and will carry you up the steep, dizzying incline to this majestic destination above. The Montserrat Monastery hours are 10:00 a.m. to 5:45 p.m. and is open all week long. Tickets can be purchased through the Montserrat Monastery website. Over one thousand years of preserved artwork and historical artifacts are kept here in this beautiful establishment. These pieces total to almost 1,300 items; the oldest of these collections can be traced all the way back to 13th century BC Egypt. In addition to numerous icons and liturgical objects from all places and time periods, the Museum of the Montserrat is home to countless paintings created by some of the most talented artists in the world, including Picasso and Salvador Dali. One of the most beloved pieces here, however, is the statue of the Black Madonna at Montserrat Monastery; visitors and locals alike flock to see this beautiful representation the patron saint of Catalonia. In addition to touring the many art displays and history exhibits, the Montserrat Monastery offers many other activities as well. An interactive audiovisual room is available to help visitors learn more about the three pillars that support this institution: the mountain, the sanctuary, and the monastery. For further education, you can also take a Montserrat Monastery map and an audio guide to lead you on a tour of the Holy Cave, the Basilica, and the Degatolls’ Path. This area also includes the Montserrat Nature Park, a gorgeous portion of the great outdoors that contains numerous trails for walking and hiking. Go on a stroll along the Hermitage Trail, where individuals traversed for years and years to reach a place of peace for quiet meditation and contemplation. You can also climb to the top of the Montserrat Peak for jaw-dropping, panoramic views of the surrounding scenery, or take a one-day course on rock climbing to learn a new, exciting skill! Experienced hikers love the challenge that the Cavall Bernat presents; this long, slender rock needle protruding from the face of the mountain is a climb meant only for expert outdoorsmen! Complete your fantastic getaway to Barcelona by treating yourself to a stay in the finest accommodations! bizFlats provides luxurious vacation rentals, each equipped with amazing amenities, throughout the most stunning areas of the city. Check our availability and book your stay today to start planning a trip to remember! Montserrat’s serene setting continues to attract not just spiritual pilgrims, but also naturalists and those in need of some time in mountains. This destination soaring above the Barcelona skyline, whose name means “sawn mountain”, makes not only for an incredibly unique horizon, but also a convenient natural retreat for locals and visitors alike. Whether you’re heading on your day trip to Monsterrat to visit the monastery, the museum or for an event, give yourself some time to explore one of the numerous hiking trails on the mountain. No matter your timing or fitness level there are varying degrees of difficulty to choose from, all offering breathtaking views and the peace and quiet unique to mountaintops. The walk from Montserrat Monastery to the Degotalls is a perfect, leisurely walk recommended for those seeking a time for self meditation. Just 3.2 kilometers in length, it should take you about 50 minutes to complete. On this hike you’ll get a great view of the Pyrenees and the flat lands of the Llobregat Valley. One of the most popular walks is from the Monastery to Santa Cova, an important pilgrim site. This is a more challenging trail with a steep incline at the end of its 2.7 kilometers. It should take about an hour and ten minutes to complete. There is a funicular lift on site at Montserrat to make its challenging terrain accessible to all. 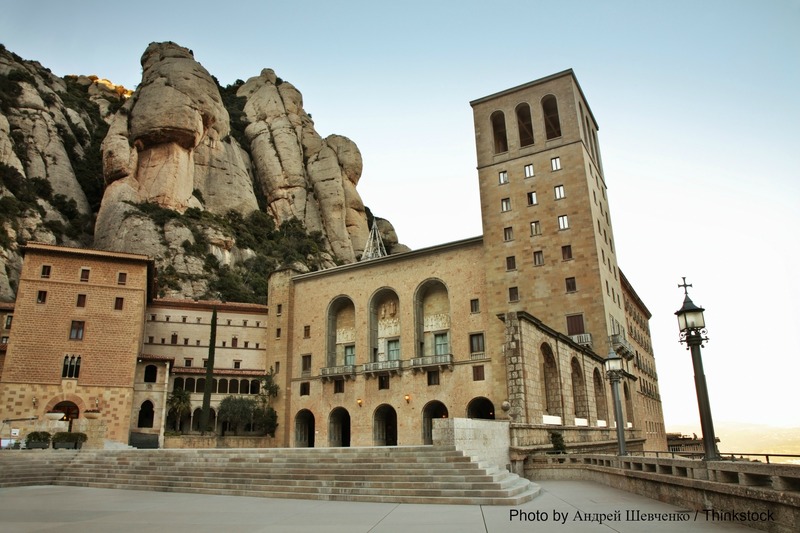 The trails from the Sant Joan Funicular Station to the Monastery make for two great hikes. The first option brings hikers to the peak of Montserrat Mountain, offering some of the most amazing views in all the the Montserrat Natural Park, and is 7.5 kilometers in length. The second option is a gradual walk stretching for 5.2 kilometers with great views of the Llobregat Valley and its river, and is significantly easier than the first route. 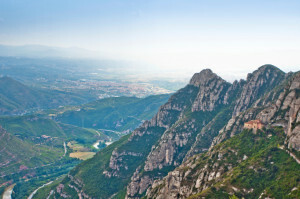 A day trip to Montserrat is easy to do from your vacation rental in Barcelona. You can take public transit to the base of the park, and hop on the Cramallera train to the peak, or ride the Cable Car up. 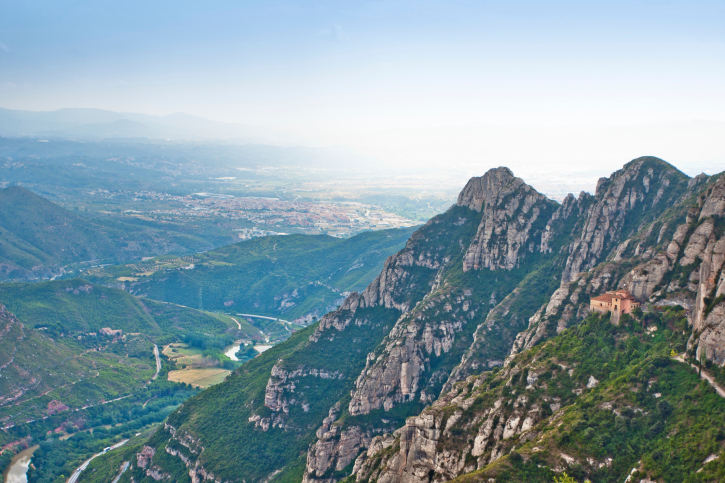 If you have a car you can also drive up, but if you’re feeling particularly adventurous you can even walk up the Montserrat mountain, which is an age old tradition. The Montserrat Natural Park attracts many with its unique jagged shape of its limestone peaks and evergreen forests, which are also scattered with maple, lime and hazelnut trees. The setting offers great wildlife viewing opportunities, especially for being so close to the city. Bird watchers love to come for a walk on the mountain, and there are annual wild boar hunting trips organized in-season. Whether you’re seeking spiritual solace, or just a beautiful landscape to breathe in on an easy day trip to Montserrat, you won’t be disappointed by what you find on your trek up the mountain. Barcelona is unique for its proximity to both mountains and sea, making it a wonderful vacation option with a myriad of great rental properties throughout the city.